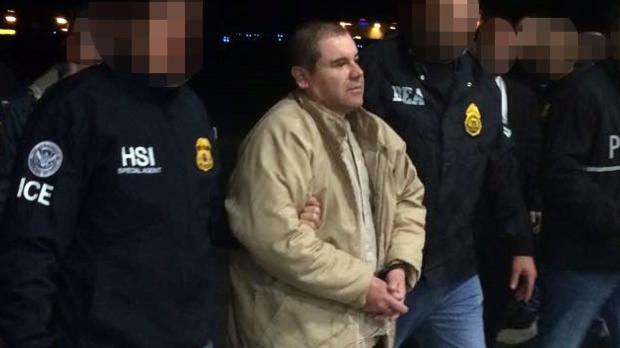 Joaquin Guzman, known as "El Chapo. Mexican mobster Joaquin "El Chapo" Guzman was found guilty on Tuesday by a New York jury of crimes spanning a quarter of a century as head of one of the world's most powerful drugs gangs. The 61-year-old former head of the Sinaloa cartel -- famed for his brazen escapes from Mexican prisons -- faces a possible life sentence after being convicted of smuggling tons of cocaine, heroin, methamphetamine and marijuana into the United States. In a three-month trial that unfolded like a real-life telenovela, Guzman's ex-henchmen and a former mistress took the witness stand under the gaze of the onetime drugs kingpin. His young wife, onetime beauty queen Emma Coronel, was ever present in the courtroom. The government, meanwhile, appealed to the jury not to let Guzman escape -- an allusion to his two spectacular jail breaks in Mexico, the last one in 2015 through a tunnel from a shower area in his cell. The defence's strategy centered on attacking the credibility of the cooperating witnesses -- former secretaries, pilots, cocaine suppliers, Guzman's top trafficker in the United States, a manager, an accountant, a former communications chief, and even a former lover. "Those witnesses not only admitted to lying every day of their lives, their miserable, selfish lives -- they lied to you here in the courtroom," Lichtman said.